This is one of the two articles that bring us Dynamic Data Masking solutions (1) Using Security layer, and (2) Using SQL Server 2016 new feature, which is this article. Both articles use the same introduction and preparation. If you already created all the basic elements from the other article, then you can jump to the next section: Implementing Dynamic Data Masking feature in SQL Server 2016. DDM does not intend to fully prevent unauthorized access to sensitive data. For this we can revoke any use of the data, on database level, on elements level (table, view, functions, etc’), on rows level (built-in from SQL 2016 version), on columns level, etc’. By revoking permissions to use the data, any attempt of using the unauthorized data will raise error. Instead of fully prevent unauthorized access to sensitive data, DDM gives us solutions to expose some of the information, while masking the rest. This allows us to determine how and which parts of the information will be exposed. For example, a supporter at a call center may identify callers by the 4 last digits of their Credit Card number. Therefore, we do not want to fully prevent access to to the sensitive data (credit card number). We need to expose this part of the data (the 4 last digits), but at the same time, the credit card number should not be fully exposed to the supporter. In other words, we want to mask part of the data while exposing other part of the data. In this article we will focus on the new feature that was added to SQL Server 2016, named Dynamic Data Masking. This solution based on policy-based security Feature at Database level. Some of these details may change by the time SQL Server 2016 is released. Please follow the Comments & Conclusions section, for updates. > Uses zeros for numeric data types. > Uses xxxx for string data types. > Uses 01.01.2000 for date and time data types. 2. partial: Exposed several letters in the start and in the end, according to the length that we chose, and added a custom padded string or masks all the rest of the data in the middle. 4. Random: Can be used on any numeric type in order to return a random value within the range of the first parameter to the second parameter. Adding, replacing, or removing the mask of a column, requires the ALTER ANY MASK permission and ALTER permission on the table. The CONTROL permission on the database includes both. Grant the UNMASK permission to a user to enable them to retrieve unmasked data. In order to show the power of Dynamic Data Masking you can open two connection to the database, one connection with your main user (the user that have full permissions), and one connection using the new LOGIN that we created in this article. Another option is just using your main user and execute first test as current user and use impersonating to the new user that we created using "EXECUTE AS" For the second test. At CTP 2.0 this feature is NOT A SECURITY feature and you should not use it for security masking !!! You can use simple CONVERT on masked column without permissions and you will get the data fully exposed! For security issue you should work with security layer. In any case according to Microsoft BOL, this feature is not intended to hide data from people who have ad hoc query access, so don't rely on it to do so. This article is based on SQL Server CTP 2.0. We will update it as new CTP versions will be released till the official final SQL Server 2016 will be released. If you have any information regarding this feature that was updated in the new CTP, please feel free to edit this article and add it as a comment in this section. No need to activate TRACEON (209,219,-1). Actually if you will activate it, then you might get error. Keep it off. CONVERT the data, on types that are supported will no longer fully exposed the original data. But the masking does not apply exactly as specified! Using CONVERT on masked data, will revert the data to the default four-character masking XXXX. This will probably lead to application failure, if our application needs to get a specific format! For example, if we use email then we expect to get @ but our query using CONVERT will return XXXX instead. Moreover if we expect to get integer from the integer column, we will get a string XXXX that will lead to application failure. Simple workaround INT can be achieved using CONVERT(nchar(100),[SalaryINR]) + 1 instead of CONVERT(nchar(100),[SalaryINR]). At this version this will return 0 instead of XXXX (same as [SalaryINR] + 1). sql_variant, uniqueidentifier, xml, cursor, timestamp table, hierarchyid, binary, image, varbinary Spatial Types. 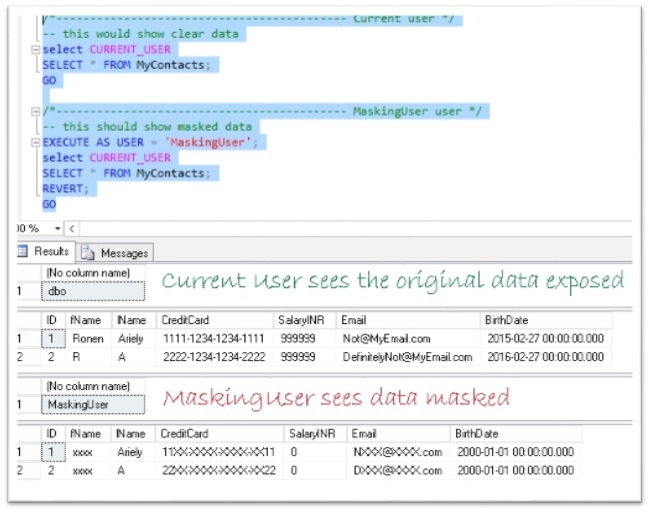 SQL Server 2016 introduces a new security feature called Dynamic Data Masking (DDM). In this article we explained what is DDM in general, and how we can use the new feature in order to implement DDM on column's levels.